DST observed except for Queensland. 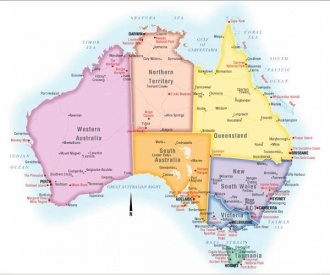 Australia is both a continent and the world's largest island, with a landmass of 7,617,930 km2 (2,941,300 mi2). Surrounded by the Indian and Pacific oceans, Australia is separated from Asia by the Arafura and Timor seas. 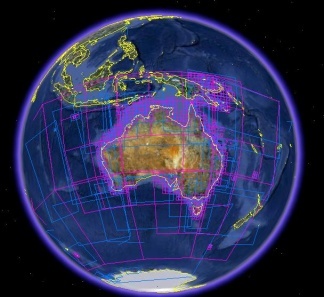 Australia has 34,218 km (21,262 mi) of coastline (excluding all offshore islands) and claims an extensive exclusive economic zone of 8,148,250 km2 (3,146,060 mi2) including some areas of the north-west continental shelf disputed by Indonesia. This exclusive economic zone does not include the Australian Antarctic Territory. The Great Barrier Reef, the world's largest coral reef, lies a short distance off the north-east coast and extends for over 2,000 km (1,240 mi). Mount Augustus, claimed to be the world's largest monolith, is located in Western Australia. At 2,228 m (7,310 ft), Mount Kosciuszko on the Great Dividing Range is the highest mountain on the Australian mainland, although Mawson Peak on the remote Australian territory of Heard Island is taller at 2,745 m (9,006 ft). The main route for visiting cruisers lies between Sydney on the east coast and Darwin in the north, from where a jump to Asia is usual. The Whitsunday Passage in Queensland is a favoured destination, with protected reefs and islands abounding and very picturesque marine life. Those wishing to circumnavigate usually go anticlockwise, and provisioning on the west coast can be difficult. Fortunately this unspoiled area is teeming with fish and the many natural wonders make the journey more than worthwhile. Ashmore and Cartier Islands — uninhabited. The Ashmore Reef is overseen by a resident warden under the National Parks and Wildlife Act 1975, and permission to land must be sought by radio from the caretaker vessel. Private vessels are ordinarily permitted to anchor and obtain fresh water from the pump on West Island. Commercial vessels must be in possession of a Commercial Permit at a cost of $2000 per annum (1997 prices). They are also required to be under Australian Marine Safety Authority (AMSA) survey. Cruising yachts should not attempt to land on Cartier Island due to unexploded ordnance left over from WWII. Heard Island and McDonald Islands — subantarctic research station. Macquarie Island — subantarctic research station. Regardless of the above, the cruising yacht should always carry a 405MHz digital EPIRB (Emergency Position Indicating Radio Beacon) and this is now mandatory for any yacht sailing further than 2NM offshore. Older devices on 121.5MHz are no longer monitored. PETS: If you have animals aboard you may ONLY anchor out (not allowed to tie up at a marina or dock), and the animal must be kept on board and confined (in a cage or below decks) at all times. Quarantine must be notified of your intention to change mooring at least 48 hours prior to moving, as well as the proposed itinerary in Australian waters. Permission to go to a dock to take fuel or water must be obtained in advance. While at the dock, the animal must be locked below. Permission must also be obtained before sailing to another area. The boat must be locked up whenever the crew is away. If embarking animals in Australia, they must have a health certificate issued by a veterinarian. Regular inspections are carried out at the yacht owner's expense (very costly) and moving the animal ashore into quarantine is also a very costly and difficult experience. Since the New York 9/11 tragedy Australia's security measures at airports have been stepped up severely, and due to the constant arrival of illegal immigrants (aka "boat people") Customs have increased coastal surveillance to nearly Orwellian proportions, with local craft often queried and boarded in Australian waters for no good reason. Such is the price of security. Flouridated supplies in major cities, tank water in country regions. Circumnavigating Australia's Coastline by Jeff Toghill. Buy particularly volume 2 Ports and Anchorages.